What does a nurse educator do on a daily basis? If you would like to work in both the field of nursing and the field of education, this could be a great career choice for you. As a nurse educator, you will need to compassion of a nursing professional and the guidance skills of an educator to succeed in this subfield that is high in demand. The very first step to determining whether or not nurse education is right for you is finding out what your daily duties and responsibilities will be. Read on, and learn about the role of a nurse educator and how you can become one. What is the Primary Role of a Nurse Educator? by encouraging their students and pushing them to succeed. What Are Some of the Many Duties of a Nurse Educator? Duties performed by nursing educators depends entirely on the setting in which they work and what education level that they are teaching. If you are working in a university setting, you may spend a majority of your time in a classroom setting running a classroom and teaching lesson plans much like a general teacher. If you are working in a hospital setting, it is not abnormal to work with both students and patients. Educators that work with patients may teach patients about their diagnosis, develop patient care programs, run the projects, or conduct research for hospital grants. Almost all educators in nursing will attend annual conferences where they will speak and listen to other nursing speakers. If you have always wanted to work in healthcare and you think you are best suited to be an educator, this is a great career option to consider. If you would like to teach a classroom of students that are studying to earn their associate’s degree or Bachelor of Science in Nursing, you will need a minimum of a Master’s degree. Educators who want to move up and work in research or teach master’s degree students may need to earn a doctoral degree in nursing before they will be considered for this upper-level position. It is very important to compare degree programs so that you can find an accredited option that will take you down the correct path to become a nurse educator. Once you earn the correct amount of credits, research the process to earning your certification through the National League for Nursing and give yourself leverage in the field. If you want to work in an intellectually stimulating environment where you have the opportunity to teach anywhere in the world, becoming a nurse educator may be the answer. 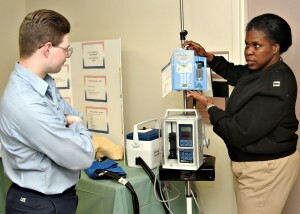 This is the best option for people who have a passion for nursing and who want to help shape the future of healthcare. Now that you know what a nurse educator does, it is time to decide if this is the right career path for you.